Is the wall above your couch looking naked? If so, you can try anything from a statement piece to a grouping of sketches to complete your space. The possibilities are endless – but they don’t have to be overwhelming! Use these tasteful styles and hanging options as inspiration to transform your living room. Not sure you want to tackle it alone? Tell us about your space to get started with a fresh new look to your space. Complement your sleek modern grey scale with a bold black and white instead of a textured neutral. This sophisticated contrast never gets old. Placing the piece across from a window (like the piece above by Thomas Hammer) lets the vibrant city bring in light and color while the room stays crisp and clean. Need a break from the concrete jungle outside? Bring some fresh air into your living room with a nature scene. The best part: you can have lush forests with no mosquitos and sandy beaches without the humidity. Need inspiration? Oregon-based Sugarlift artist Kati Dimoff (whose work is pictured above) can help you bring that chill west coast vibe into your home. When adding artwork to your space, playing around with colors is always encouraged—just make sure to avoid channeling your inner matchy-matchy Stepford wife. 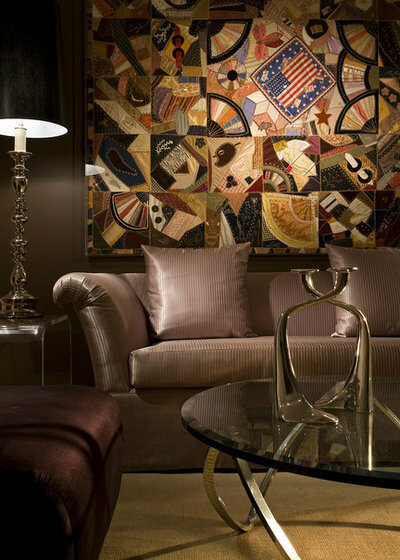 Instead, use art to emphasize shades and textures that highlight deeper tones in your room. Here, the blue side tables, pillow, and book match the painting’s color pallet, but introduce new shades, shapes, and complimentary colors. Don’t let the bougie art lingo scare you away – a diptych is just a piece of art with two panels. Here, Brooklynite Lizzie Gill’s modern digital collage artworks are perfect for a room with mixed colors and patterns. The two pieces start a conversation with each other. Get ready for when you take them home and the rest of the room joins in! What if your wall is naked but your furniture is amazing? Don’t think your sofa and your painting need to fight it out for attention. A textured neutral will draw your attention, soften your space, and bring in a nice glow that will compliment your interior decor – not offend it! 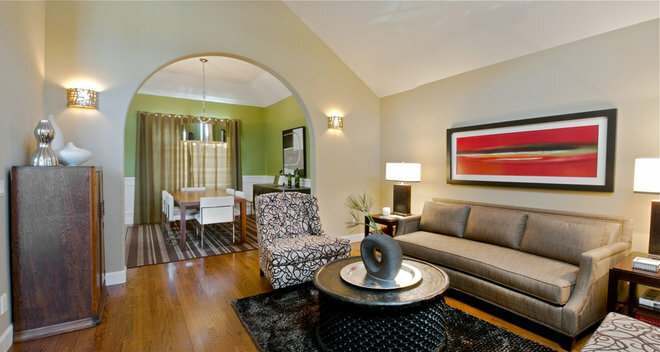 Something bold and painterly above the sofa adds energy to a room. In this piece, the colorful and unpredictable lines radiate throughout the room. Pro tip: too big is always better than too small. Because this piece is wider than the couch, the bold design and large frame really demonstrate how a statement piece can elevate your living room to a new level. A stimulating layered piece will have you completely absorbed. You won’t just be trying to unravel the artist’s process, you’ll be following the washes of color in the piece and noticing how the green background really brings out your hubby’s eyes while he complains about the office. If a single large piece feels too serious, a gallery wall is the perfect, playful alternative. Because gallery walls feature multiple artworks hung together, they can be fun, creative, and great for those of us with commitment issues. Show off your love for the phases of the moon next to a small work by both your favorite fine artists and the best painters in the world – your kids! If you’re interested in keeping it cohesive, try matching frames (like above) or use similar colors and forms in the pieces themselves. The similarities will draw your eye throughout the collection. An optical illusion piece not only catches your attention, but keeps your eye as the piece seems to undulate and evolve in front of you! Artists like Bridget Riley, M. C. Escher, and Karan Singh (whose work is pictured above) keep your clean, bright, sophisticate style intact and your mind engaged. This vertical piece brings character to your room. Here, the figure catches your eye in the center of the piece and the verticality directs your gaze down to the couch. 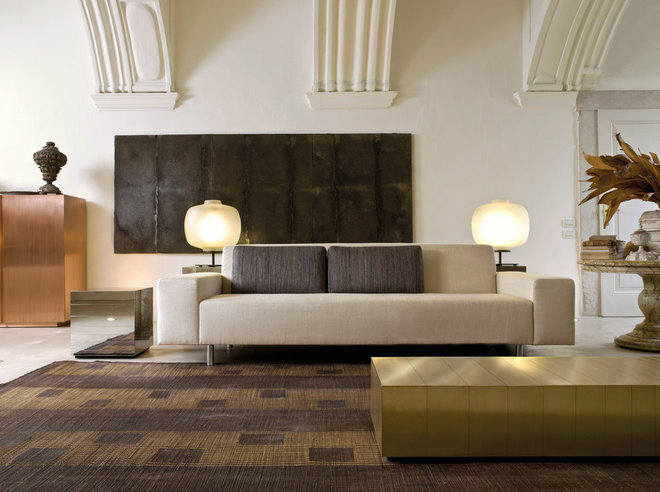 This not only intensifies the relationship between your art and furniture, but also makes your space feel larger. Center a vertical piece above a love seat or L-shaped couch to give the illusion that the only thing that fits up the stairs of your charming walk-up is at least three inches longer than it measures. Capitalize on tall ceilings, embrace those perpendicular lines, and go for it. Artists get into a real tizzy about the subject of people looking for art-to-match-the-sofa. Coming from a background as an artist, I always encourage my interior design clients to select art first if they don’t have any so they feel free to buy what they love and not worry about what it goes with. And then we can plan the decor around the art. I’m sure I’ll get an irate artist or two commenting here. I’ve spoken with some artists who feel the art completely stands on its own and should have nothing to do with the decor. Here’s the simple fact. No matter how irritated artists get by the subject of art-matching-the-sofa, your art will always look better and have greater impact in the space when the decor supports the art. Here are techniques you can use in your decor to support your art and make it even better. 1. Repetition of color and line. This art is so well supported by this room. The strong black-and-white graphic image is echoed in the black-and-white upholstery with lines that are similar to the curves in the woman’s face. Even with the bright yellow accents in the room, the art is still the standout. 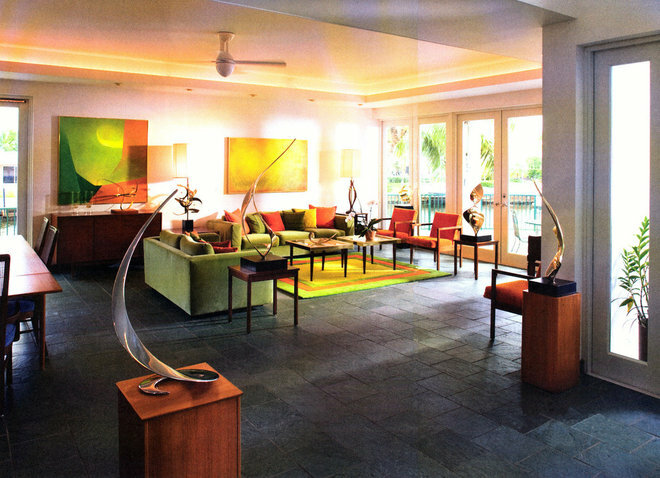 Repeating color from the art increases its impact in the room. Here, the green bed pillows pull their color from the art. Without them, the art doesn’t feel quite as strong. Try it! Put your finger just over the pillows in the picture. Having that bit of green on the bed to echo the color visually strengthens the art. 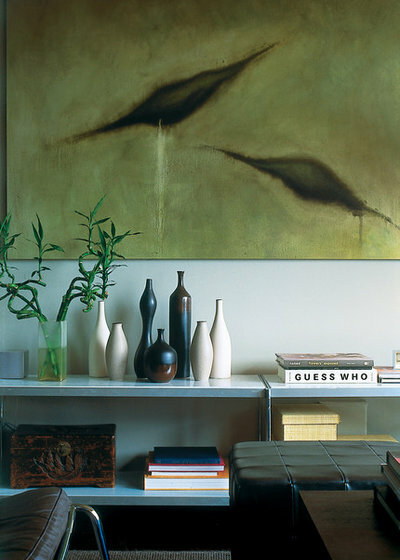 The undulating lines of the vases on this table pick up the shapes from the painting and increases its visual interest. There are a lot of ways to repeat the lines in art. This dining table emulates the curves and the color of the center of the painting. The floral display brings in more of the color. 2. Balance of color. This art has a lot of black with just a little bit of red. 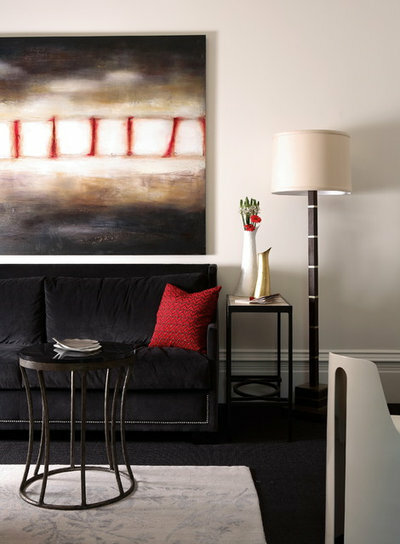 The black sofa with just a little red pillow keeps the same balance of colors as the art. Carrying that balance of color though the furnishings spreads the influence of the painting. 3. Multiple works of art. Combining multiple works of art by the same artist or that have a very similar style creates greater impact. 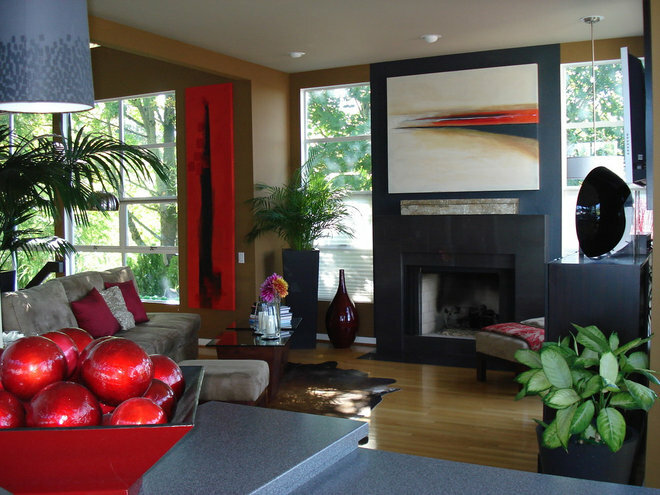 Here the art above the fireplace and the red painting on the wall work together to contrast their strong horizontal and vertical lines, balancing each other and drawing your eye first to one, then the other, and back again. Together they create a stronger look than each would have by itself. 4. Furniture placement. Placement of your art is important, but so is the placement of your other furnishings around the art. This painting would have looked great on the wall all by itself. But the wavy bench underlines the painting and gives it emphasis, the same as underlining a word in a sentence. 5. Reflection. Through the placement of mirrors on the wall and ceiling, walking down the hall you get this painting repeated in reverse and upside down. It’s a pretty dramatic way to get you noticing the reflections then studying the painting to see how it looks when it isn’t turned upside down and backwards. 6. Restraint: Sometimes you can support art by just exercising some restraint and letting it be the star of the room. The quilt behind this sofa is extremely detailed and really invites inspection. By keeping the sofa, chair, wall color, lampshade and rug in a monochromatic scheme, the designer gives your eye someplace to rest. In this case, because of the level of detail in the art, picking up colors and shapes in accessories would actually distract. The green slash of color in the painting is only repeated in the wall of the dining room visible through the arch … and nowhere else. It has more impact than it would if accessories all over the room picked up the color. 7. The color palette. Going beyond just picking up a single color from a painting, this room has used all of the colors in the art for the room’s entire color palette. This artwork is by the homeowner, so she was able to surround herself with colors that she loves. The rug seems to pick up all of the colors of the painting on the left. I wonder if it is custom or just a very lucky find? 8. Style. 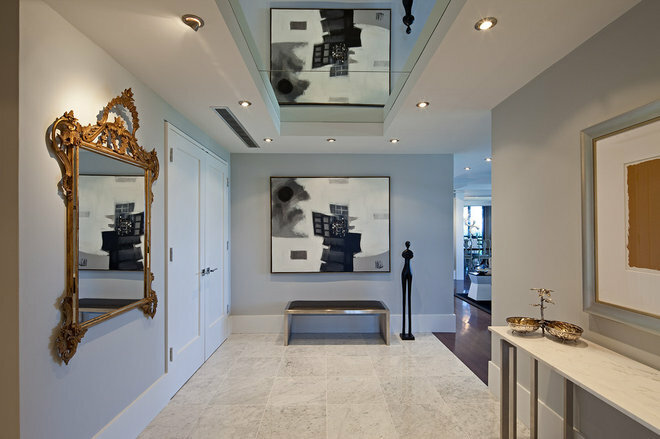 The art above the stairs is contemporary, with clear and bright colors. 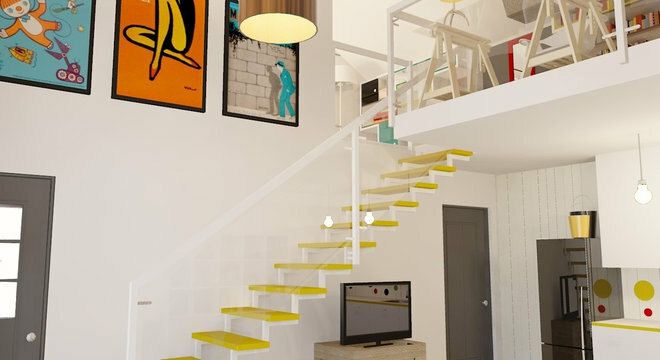 The yellow open stair treads feel just as fresh as the artwork and complements it beautifully. The style of the artwork is soft and serene. The style of the decor complements it beautifully with the same muted color palette and soft velvety textures. 9. Humor. I have to confess that I’ve bought plenty of art because the subject made me laugh out loud. In my own entryway I have a large portrait of my husband making a funny face. It stops first time visitors in their tracks when they see it, then gets a belly laugh, and the conversation gets off to a great start. This large painting of a boy picking his nose is pretty outrageous. 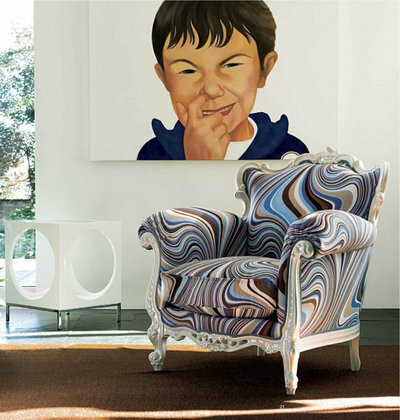 The chair below it is pretty outrageous too, with the wild contemporary print on a traditional chair style. Don’t be afraid to have a little fun with your art and decor. It doesn’t need to be serious all the time. 10. Lighting. Most people realize that putting a spotlight on your art will highlight it and make it stand out. But in this room the lighting increases the impact of the art by the shadows cast. Using lighting to enhance your art is another big subject, so I’ll have to go into that in another Ideabook. Combine techniques. Using a combination of the above techniques creates a very strong design. This room is so expertly done and supports the art so uniquely. The large black rectangle of the art is found in the shape of the pillows and again in the pattern in the rug. Notice how the art is not centered behind the sofa. That staggering of rectangles is picked up in the pattern of the rug — in the placement of the pillows to one end of the sofa — and again in the off-center placement of the coffee table. It combines repetition of color, repetition of shape, and furniture placement to add emphasis. This room also employs a few techniques. The sculpture in the corner and the painting share several colors so they work beautifully together. A very subtle touch is the shape of the black chandelier repeating the curves of the women’s bustiers in the painting. Subtle, but very effective. What ways have you found to enhance the art in your home? Changing on how you feel about your existing life is pretty easy. 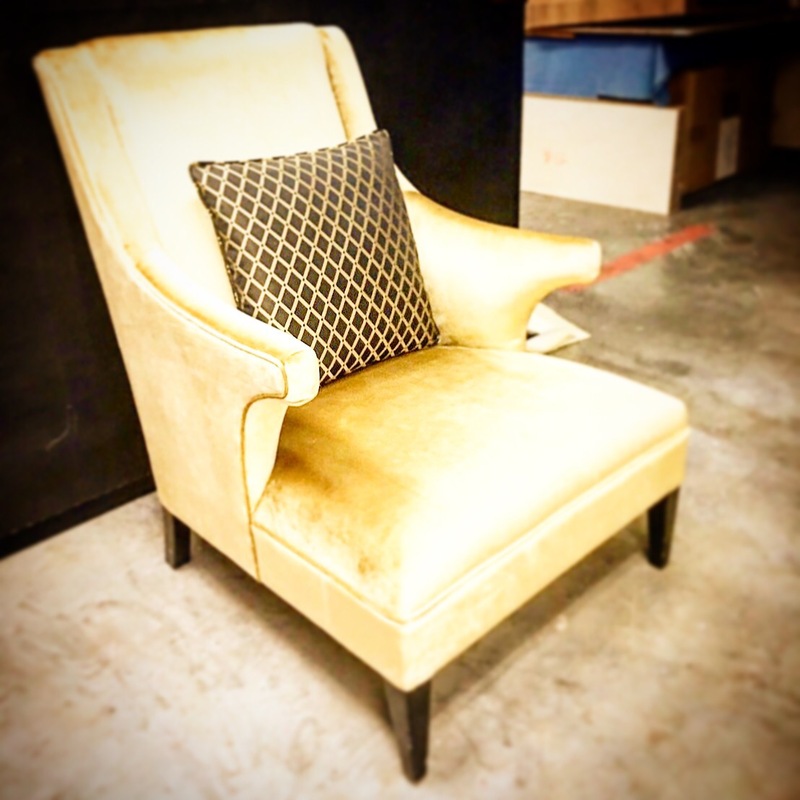 Change your furniture to this bright gold upholstery and immediately you will feel totally different!